Reviews of Mackintosh Queen's Cross from previous visitors. • An awe-inspiring building. • Completely wonderful. • Glasgow’s hidden gem. • Simplicity at its best. • A pleasure to visit – friendly staff. • Breathtaking. • An artistic treasure house. • Mackintosh was a genius. • A truly beautiful space. The Mackintosh Church was the highlight of our Mackintosh trip to Glasgow. It was the most authentic experience of all the buildings we visited, it was delightful. This is a church designed by Rennie Mackintosh in the down to earth Maryhill area. It no longer functions as a church but is owned/run by the Rennie Mackintosh Society, and well maintained. It has all the style and simplicity you would expect from this architect and retains a very Protestant feel. There are interesting drawings and designs in the church hall and the views and feel you get from up in the gallery are quite something. The Church was the only one designed entirely by Rennie Mack to be built and it is a really interesting space with it’s clear light, upturned boat roof and gothic type/Mack style features. Check closely as it is quite subtle, but features of doors, balconies and the pulip are lovely. Facilities are good too with nice loos, a small shop and resource centre and a refreshment area for tea and coffee. What blew us away today was the huge model of the moon suspended from the ceiling. Astoundingly interesting and beautiful you can look from all angles and see all the major sites. If you look long enough some trick of the eye seems to make it move. You can’t take your eyes off it so this will probably happen – don’t be too spooked. We were absolutely delighted to have Museum of the Moon at Mackintosh Queen’s Cross as part of Mackintosh 150. The Moon has been a major influence on artists, musicians and poets throughout the centuries. A young Charles Rennie Mackintosh was no different; in 1892 he created his first symbolist watercolour, The Harvest Moon. This depicts the annual phenomenon, when the first full moon is closest to the autumnal equinox or the time of year when crops are traditionally harvested. 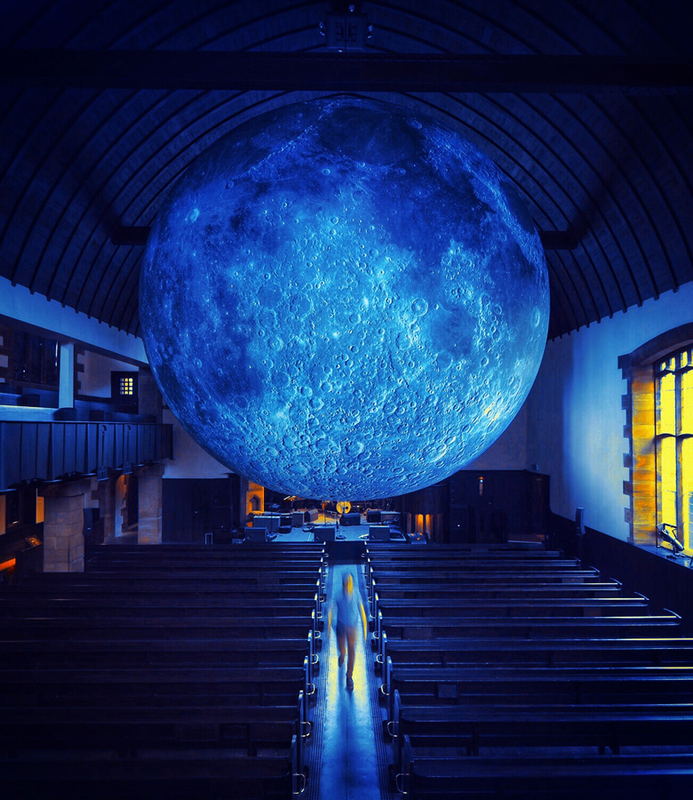 Luke Jerram’s stunning Museum of the Moon installation was a daring concept for the Society, but the effect within Mackintosh Queen’s Cross was totally breathtaking and mesmerising. This combined by a conceptualised programme of events created a unique and intimate experience where visuals and music became one. Truly outstanding in every way and a big thank you must go to everybody concerned. “It is such a true representative of the Moon, with every dent, every shadow and every crater. It is so incredibly overwhelming in this beautiful space”. We’ve tallied up our numbers and over the 6 weeks the Moon was in place we welcomed nearly 6,000 day visitors to Mackintosh Queen’s Cross! When we combine this with our programme of evening events we had over 11,000, which surpasses last year’s total visitor figures! It has been a great experience working with new partners on this project and building up an excellent working relationship. So a big thank you must go to Synergy Concerts, UZ Arts, and Take Me Somewhere. And a special thank you to Lisa Watt who handled all the media for Mackintosh150 and Museum of the Moon. We would not have been able to fulfil the demands of the installation without our dedicated team of staff and volunteers, so a big thank you goes to them for helping us make this such a success. With Mackintosh such a topic of discussion and debate at the moment, this success proves Mackintosh Queen’s Cross to be an important and much loved space for Mackintosh appreciation and for contemporary art works and installations. Museum of the Moon was definitely one of the highlights of the year. First Bus 60/60A & 61 or City Bus 17 from Hope Street at Central Station. Alight at St George’s Cross then 15 minute walk through Cromwell Street into Maryhill Road. Train to Central or Queen Street Station then bus as above. M8 J15 eastbound or J17 westbound. Follow Maryhill Road towards Queen’s Cross and turn right into Hinshaw Street. At the lights, go straight across into Firhill Road. Take second on left into Springbank Street and the Church is at the end of the street. On street parking available. For wheelchair access please notify us prior to arrival and we will assist. • Wheelchair access is available on the ground floor only. • We have one disabled toilet available on the ground floor. Please call us between Monday – Friday 10.00 – 17.00 (except bank holidays) on 0141 946 6600 or email info@crmsociety.com and we will get back to you as soon as we can. Mackintosh Queen’s Cross is one of Glasgow’s hidden architectural gems. The only church in the world designed by the great Scottish architect, designer and artist, Charles Rennie Mackintosh. 870 Garscube Road, Glasgow G20 7EL.